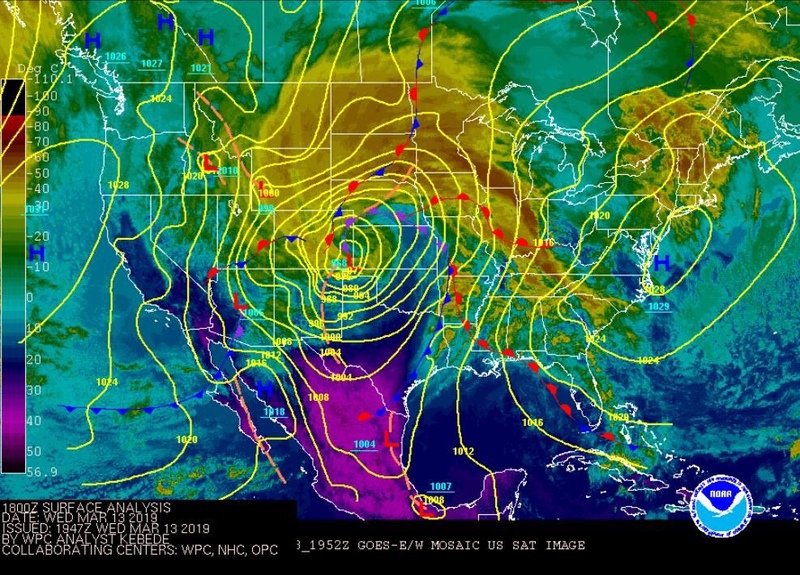 The Bomb Cyclone (explosive cyclogenesis) that hit Colorado on March 13, 2019 resulted in Category 2 Hurricane Force Winds (96 mph+) and whiteout conditions. Visibility on the roads was reduced to 0 feet, and thousands of cars were stuck on the roads. Hundreds of schools and businesses closed, and flights at two major airports were cancelled. Emergency Services made the decision to only respond to life threatening emergencies. Snow plows ceased operations due to the dangerous driving conditions. My plan to chase this Bomb Cyclone was to leave my house around 10 am just as the blizzard was starting and drive to Monument Hill - an area along I-25 known to be especially bad for travel during snow storms. I was hoping to record some car spinouts and people struggling to make it to the top of the hill. As luck would have it though, stupidity started early. Before I could even leave my house, a 40 car pileup was reported at Monument Hill. With the blizzard hitting on the worst end of what was predicted, I started north from my house around 10 am and took a few wind readings just shy of 40 mph before coming across a few stuck cars. The rule of storm chasing is that if you come across someone who needs help, you end your chase and help them. So I helped three of the motorists move their vehicles off to the side of the road. Two of the drivers got in my car, and one decided to stay in their car. After chaining up, I drove the two stranded motorists home. I tried to return to pick up more people, but the road conditions were getting worse, and there were so many stuck cars that many of the roads were blocked. At that point, I decided there was no more help I could provide and I didn't want to become stuck out in the blizzard myself. My main goal was to get home before the sun set. So around 3 pm, I drove home, checking on other stuck vehicles as I passed. Luckily every other vehicle I passed was either abandoned or already had another good samaritan helping. Here is a recap of my day. This is 100% my dashcam as I never got the opportunity to stop and take video. Either visibility was too bad to see anything, or I was spending my time helping other drivers. Very impressive weather system. 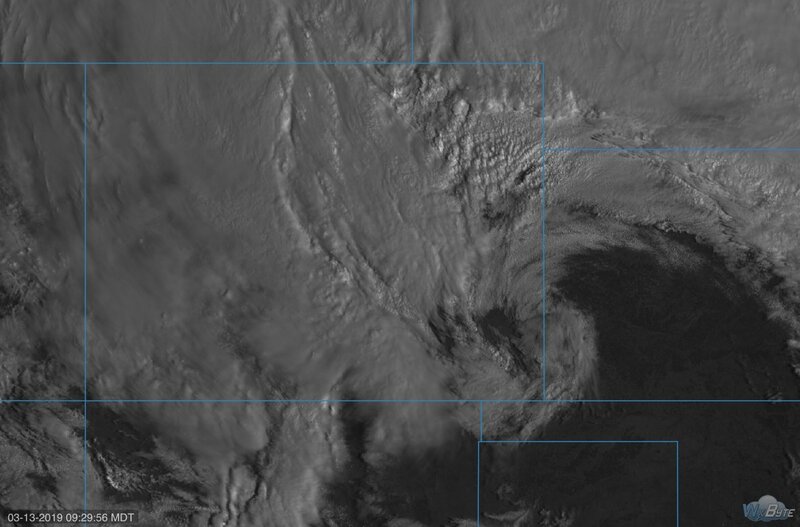 The official low pressure was 968 mb which makes this the most powerful storm to ever hit the state of Colorado. Looks to have been centered around Lamar. 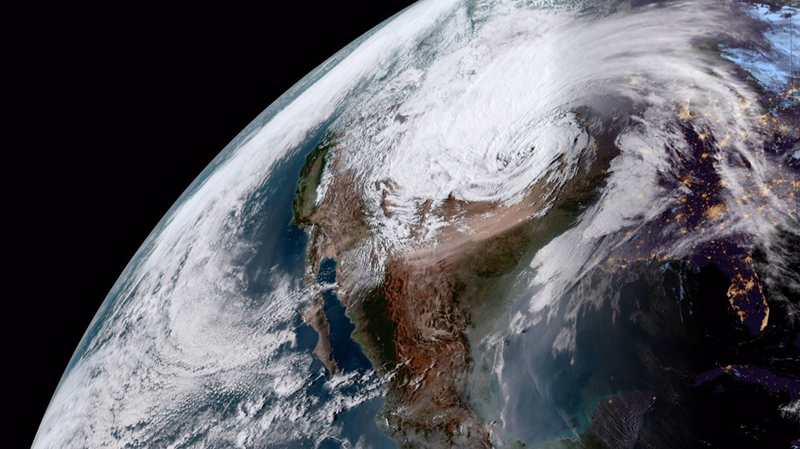 The Bomb Cyclone as viewed from space and strongly resembled a hurricane on the satellite, even appearing to have it's own eye and tiny eyewall, albeit in less organized fashion. The whole center of the storm was wound tighter than a clock spring. Rode out the storm at my place and the winds were relentless for about 22 hours straight. No official wind readings but considering I drive up in Wyoming and see 50-75 mph winds on a daily basis, I'd estimate 55-65 mph winds. Power flipped off and then right back on repeatedly from about 11:30 am - 2:30 pm then stabilized without further issue. Things were a little spooky the first few hours considering I had never experienced anything like this before, much less being on my own. This storm packed quite a punch, killing two (at least check) and injuring one. A Colorado State Trooper died on I-76 assisting a motorist, when another motorist lost control and hit the Trooper killing him. [emoji20] Another man died when he and his wife were stranded in their car which got stuck in snow drifts, the wife was hospitalized with hypothermia. I'm not aware of any other injuries or deaths. 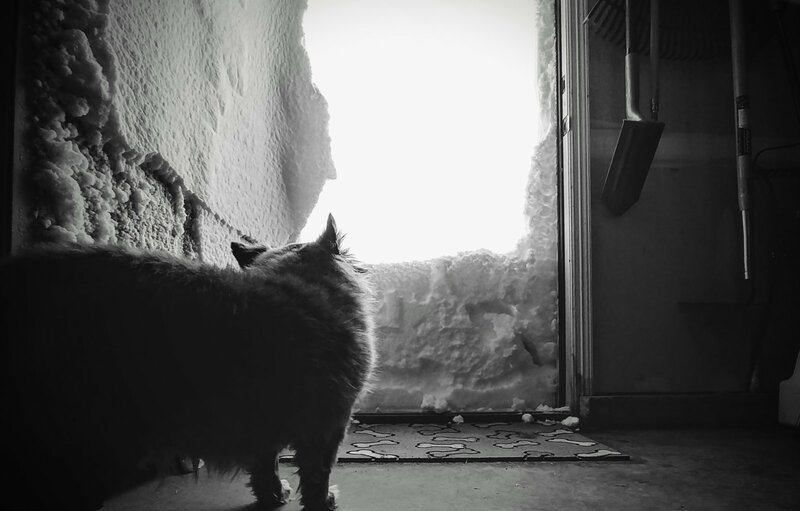 I-70 from KS to Denver was closed, I-76 from Denver to Ogalla, NE and I-25 from WY border to Colorado Springs was closed for almost 24 hours straight. It was quite a storm that affected our neighborhood for two days (getting in and out was no picnic). However: “bomb cyclone”? Is that an official meteorological term or something the media came up with for the shock and awe factor? I’ve never heard that term before so I was wondering about the rest of you. Here’s a capture from SatSquatch. It's well known in meteorological circles. It happens more frequently along/near the East Coast than over the middle of the country. A bomb cyclone is an extratropical low pressure center that deepens rapidly, with the central pressure dropping 24 millibars or more in 24 hours. I can not contribute anything to the scientific discussion, but here is my dog the morning after. He really had to pee, I had to use my snowblower to make him a path to the snow free (wind blown) back yard. Oh...sorry Marc. I thought that was a fat cat!! He is fat. But the fuzzy winter coat doesn't help. He's been banned from the groomer. As @GPhillips noted, “bomb cyclone” is a term more associated with nor’easters here in my area of Philadelphia and into the northeast. But despite living here for 20+ years, and growing up in Long Island, I don’t remember the term actually being used with a storm until about a year ago, I think it was in December 2017. But then I remember hearing it again for another storm that same winter, and now again with this storm. I would hope the media only uses the term when they hear it from the weather enterprise in formal forecasts, but my cynical side wonders if the media just likes the sound of it and uses it more freely than they should. [emoji57] I’m sure for this one it was accurate though. "Bombing out" has been used for a long time in meteorological circles to describe rapidly deepening extratropical and tropical cyclones (I remember it going back to at least Hurricane Wilma as it cratered to 882 MB), but the term "bomb cylone" being widely disseminated in the media is a phenomenon that seems to have sprung up in just the last few years. It does look hurricane-ish in that satellite image. 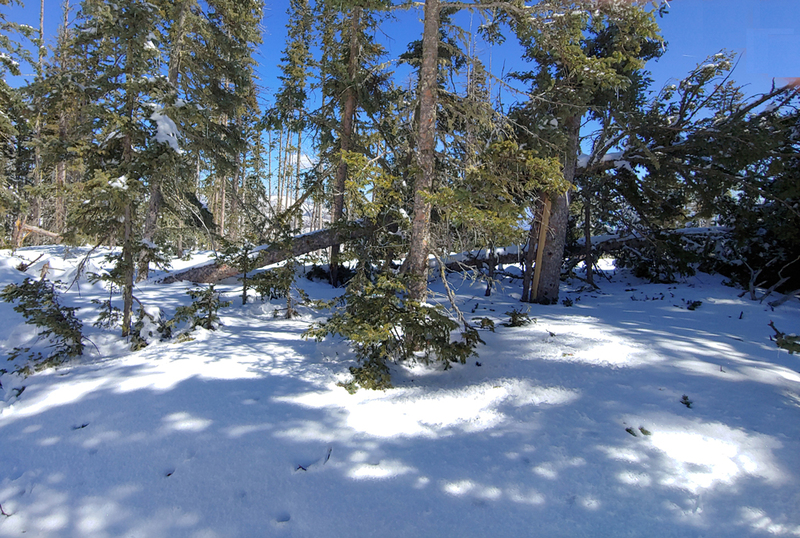 Here is a little of what it did at the Pajarito Ski Area near Los Alamos, NM. There were at least 100 trees down within the ski area, and the it was closed for 2 days because of local power outages.